The Earmold Australia® is committed to supporting the National Principles for the Fair Handling of Personal Information established by the Australian Federal Privacy Commissioner and embodied in the Privacy Amendment (Public Sector) Act 2000. Our policy is both to support best practice and to ensure that we comply with principles that form the basis of laws introduced to strengthen privacy protection for consumers. We believe that in supporting best practice this statement will address any potential concerns you may have about how personal information you provide to us is stored, used and accessed. The Earmold Australia® receives and stores transaction information; information you enter on our web site or have provided to us in application, registration or administration processes. Wherever it is lawful and practicable, the Earmold Australia® will endeavour to provide you with the option of not identifying yourself or not providing personal information when entering transactions with us. However, failure to provide the full and complete information we request may result in a limited ability on our part to offer or deliver complete services to you. No personal information is collected when you browse our website anonymously. Anonymous browsing is when personally identifiable information is not required by an individual to gain access to our web site. In addition, personally identifiable information such as name, birth date and contact details (e-mail addresses) are only collected when you make an enquiry or make a purchase. All other information will be requested from you directly. Information collected is kept for as long as it is needed to service your account and provide services and products requested by you. When your information is no longer needed for these purposes we will destroy or permanently render anonymous any information held about you. c. Earmold Australia® reasonably believes it is necessary to prevent any serious and imminent threat to any person's life, health or safety or the public's health or safety. 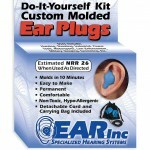 The Earmold Australia® will not otherwise disclose your personal information to any other party without your consent. Earmold Australia® will use all reasonable endeavours to ensure that you provide personal information in a secure environment and when the information is no longer needed it will be destroyed or permanently rendered anonymous. Where indicated by a lock (on the browser window), we protect the security of your information during transmission by using software, which encrypts information, you input. In conjunction with our key suppliers and agents, we operate secure data networks protected by an industry standard firewall and password protection system. We also take care to ensure that we have security measures in place to protect against the loss, misuse, unauthorised access, alteration, modification or disclosure of your user data under our control. The security of any information (including personal information) downloaded and stored on your PC\Server etc is the responsibility of the individual. The individual is also responsible for the correct configuration of the hardware and software he/she uses to access the Earmold Australia® web site, along with the physical security and maintenance of that equipment. Not with standing the fact that we take all reasonable steps to protect your personal data including the use of encryption technology, we cannot guarantee the security of any data you disclose on-line. You can help us keep your personal information secure by ensuring that any password you use on our web site is kept strictly confidential, and by logging off when you have finished using a shared computer. Earmold Australia® imposes strict rules on its employees who have access either to the databases that store your user information or to the servers that host our services and while we cannot guarantee that any unauthorised access, disclosure, loss, misuse or alteration to your data will not occur, we will take all reasonable steps to prevent such unfortunate occurrences. You accept the inherent security implications of dealing on-line over the Internet and will not hold the Earmold Australia® or its agents or suppliers responsible for any breach of security. Subject to obtaining your prior consent, Earmold Australia® may use your personal information for the purpose of providing you with information you may find of interest or important changes to the functionality or content of our web site. If you do not wish to receive this form of communication, please contact us and we will make the change to our records. We will not charge you for giving effect to such a request and will take all reasonable steps to meet your request at the earliest possible opportunity. Earmold Australia® will use all reasonable endeavours to protect and keep confidential any personally identifiable information in its possession in relation to its Members, subscribers or website visitors. If any confidential or personally identifiable information is accessed by a third party, whether by negligence or otherwise of the Earmold Australia®, its agents, suppliers, contractors, related bodies corporate, affiliates or associated parties, to the extent permitted by law, Earmold Australia® is not liable for any loss, damage, costs, liability or other form of contribution. We are constantly improving the Earmold Australia® website and the tools you can use to manage the data that you provide to us. Please refer to this page from time to time to see any new policies about the use of these new features.